Eric Dickerson rushed for more yards than any other running back during the 1980s, setting an all-time single-season rushing record, which still stands today. 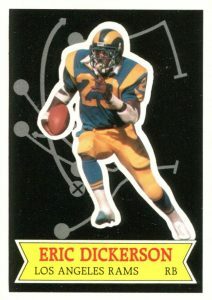 As a result, Eric Dickerson football cards are among the most popular NFL releases from the decade. This list highlights some of Dickerson's best cards including some of his earliest options. Drafted second overall by the Los Angeles Rams in 1983, Eric Dickerson instantly made an impact on the league as he was named Rookie of the Year. The following season, Dickerson had the greatest year of any running back with 2,105 yards on the ground, becoming the second RB to top 2,000 yards while breaking O.J. Simpson's record. Two seasons later, the Rams traded Dickerson to the Indianapolis Colts where he also had success, leading the league in rushing again in 1988. Second all-time with 13,259 rushing yards when he retired, Eric Dickerson was selected to the Pro Football Hall of Fame on the first ballot in 1999. Shop for Eric Dickerson Autographs on eBay. 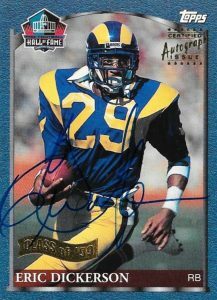 In terms of his premium cards, collectors can find plenty of Eric Dickerson autographs and relics. The more recent sets include 2015 Topps High Tek, 2016 Panini Impeccable, and 2016 Panini Plates and Patches. For fans of college football, several sets feature Dickerson as an SMU Mustang including 2005 Topps All-American, 2014 Upper Deck Football, and 2015 Panini Immaculate Collegiate. A legend at running back, Dickerson is frequently combined with other stars in high-end sets. In 2007 Topps Stadium Club, he is combined with Barry Sanders on a dual-autograph, and 2013 Topps Triple Threads has a triple autograph featuring Dickerson, Adrian Peterson, and Marshall Faulk. Although Dickerson was the second-leading rusher at the time of his retirement, his popularity with fans never quite reached the heights of Walter Payton or Emmitt Smith. 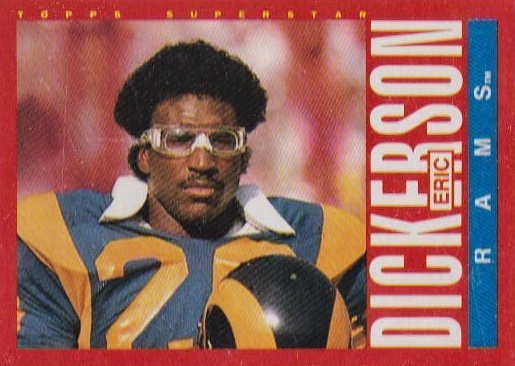 Nevertheless, Eric Dickerson cards are still a viable choice in the hobby. This list provides a great opportunity for collectors looking to build a Hall of Fame collection as most of his cards are budget-friendly. In placing the Pony Express' cards on the list, key components include card value along with design. 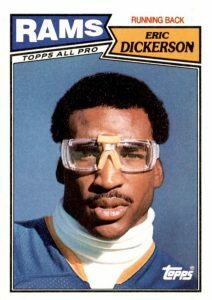 Dickerson's 1987 Topps card is probably his most striking as it features a close-up portrait with his trademark eye goggles. The goggles weren't a fashion statement. 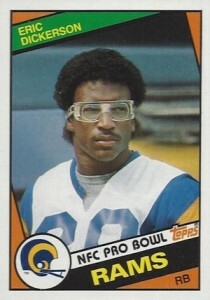 Dickerson wore them because he had very poor eyesight and problems with contact lenses staying in during the game. The '87 Topps design is one of my personal favorites with its simple look of two colored flags at the top meeting in the middle and the All-Pro designation positioned under the left flag. The green-bordered 1986 Topps features Dickerson on the sidelines with his huge shoulder pads on display. 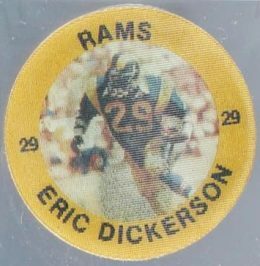 Although Dickerson would wear #29 on his jersey throughout his NFL career, he wore #19 while running for Southern Methodist University. Eric Dickerson's time at SMU was clouded with controversy as the football program would be the first to receive "the death penalty" and shut down for repeated NCAA violations. In the 1970s, the 7-Eleven chain issued two sets of plastic cups featuring portraits of top NFL stars. Nearly a decade later in 1983, the chain began issuing 3-D discs that featured both a player portrait and action shot as the disc was rotated. The first set from '83 had 15 players and the 1984 set expanded to two sets of 20 discs that were divided between stores in the eastern and western parts of the United States. 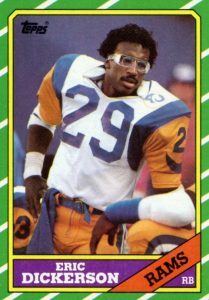 Dickerson appears in the western set as he played for the Rams of Los Angeles at the time. 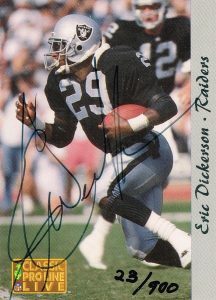 Dickerson was traded from the Colts to the Los Angeles Raiders in 1992 where he spent a single season. One of the few football cards that features him in the silver and black can be found in 1993 Classic Pro Line Live. The set displays full-bleed images on three out of four sides with a small strip containing the player's name and team on the fourth side. Pro Line Live also provides an early certified autograph for Dickerson who signed 900 cards with each hand-numbered in black ink on the front. The Notable Nicknames insert in 2016 Panini National Treasures includes stars signing with their with famous nicknames. Eric Dickerson earned the nickname "Pony Express" because of his amazing running performances at SMU. After rushing for 1,428 yards and 19 touchdowns in his junior year, he followed that up with 1,617 yards and 17 touchdowns in his senior year and a third-place finish in Heisman Trophy voting. As a huge fan of the black-bordered 1971 Topps Baseball set, my favorite Topps football design is 1985 Topps. Collectors who completed their '85 base set could move to the red-bordered cards found on the bottom of wax boxes. Dickerson was one of the 16 players featured and, besides the color difference, the hand-cut box bottom cards also have "Topps Superstar" printed across the top of the card in yellow. Moving from red borders to blue borders, 1984 Topps includes the first of three notable Eric Dickerson rookie-year appearances to make the list. Pack rippers could find one insert in each pack of '84 Topps and, in total, there were 11 stars featured with Dickerson and Dan Marino's appearances being the most valuable. Along with the glossy texture, the insert cards were also printed on thicker stock. One glossy card deserves another and so the next 1984 Dickerson appearance was a glossy card that collectors were only able to obtain through a mail-in offer. The 30-card set featured a black design that had a drawn-up football play placed behind the player's photograph. Now known as the Glossy Send-In set, fans could find contest cards in packs of 1984 Topps. Each contest card would award a certain amount of yards and once 25 yards were collected, they could be sent in to receive one of six different five-card sets. Dickerson's card is again the highlight of this insert. Dickerson was elected to the Pro Football Hall of Fame in 1999 and he was joined by Lawrence Taylor, Ozzie Newsome, Tom Mack, and Billy Shaw. Topps produced a five-card set to honor the inductees and autographed cards were issued for each player. Dickerson has since signed for other HOF-themed inserts but this was the first. 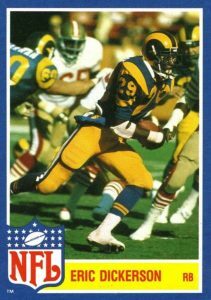 1984 Topps is arguably the crown jewel of '80s football sets as it features many notable RCs, including the sole Eric Dickerson rookie and his most sought-after card. Casual fans unfamiliar with his time at SMU must have been a bit surprised to see him sporting goggles on this card. Dickerson would start his career like no one else had with three 1,800-plus rushing seasons in his first four years.He was also the first player with seven consecutive 1,000 yard-plus rushing seasons. These accomplishments would push his rookie card values through the roof. Even today gem-mint copies can top $700 at auction. 1984 Topps Eric Dickerson Rookie Error Blank Back RARE!!! L@@K!! !